Currently, I'm trying to post once or twice a week summaries of chapters from books I've read over the past few years. These are the books that have really informed my thinking on discipleship and small groups. Hopefully, they'll provide a good opportunity for you to think through some of these same thoughts. 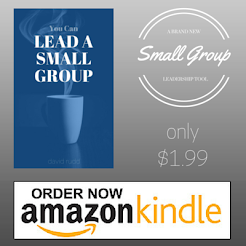 Today, I'm looking at chapter three from the book Why Small Groups, a collection of small group essays compiled by C.J. Mahaney. This chapter, by Greg Somerville, is entitled, "Take This Group and Own It." Do you think of your group as YOUR group? Do you OWN your group and its vision? Or, do you simply rent a chair on Thursday (insert your night) evenings? Somerville says, "A small group doesn't belong to the leader. It belongs to God -- and to each member." Attempting to help develop a biblical understand for Christian community, Somerville looks at 1 Peter 4:7-10 as a key teaching passage to help define the appropriate behavior for small group members. The end of all things is near. Therefore be clear minded and self-controlled so that you can pray. Above all, love each other deeply, because love covers over a multitude of sins. Offer hospitality to one another without grumbling. Each one should use whatever gift he has received to serve others, faithfully administering God's grace in its various forms. It doesn't take a highly gifted leader to build a great group. It takes you. You must own it. You must pray for it and invest in it. Whether you feel qualified or not, you and every other group member must "use whatever gift he has received to serve others."